The width of the world map. The height of the world map. The depth of the world map. This will set the map size to the dimensions specified in the width/height/depth fields, if they are valid. This will enable / disable the connectedness overlay. 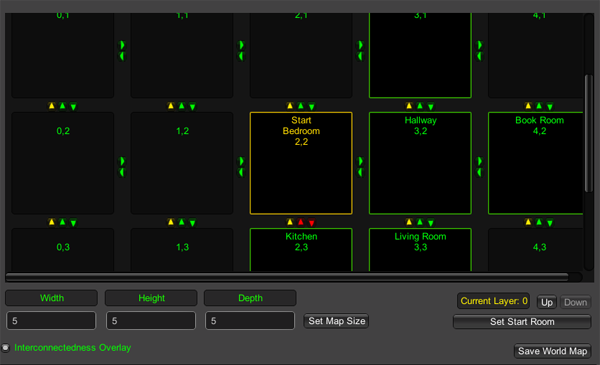 This overlay will allow you to set accessibility between rooms. This allows you to build one-way exits and also build thin walls that cannot be achieved by using Room accessibility alone. Moves to the next working layer of the map. Moves to the previous working layer of the map. By clicking this button, and then clicking the target room - this will set the Start Room of the Adventure. Shows all rooms that you have created in your adventure, excluding those that are already in the map. By selecting one of these rooms, and then clicking on the desired map location, you will add the Room to the Map. Shown on the screenshot as small arrows between rooms on the map. Outer arrows control up / down accessibility. Inner arrows control north / east / south / west accessibility. When red, the player cannot move in this direction. When green (cardinal) or yellow (dimensional), the player can move in this direction.